and Why Should I Care!? If you own a car, truck, motorcycle, RV or any other type of motorized vehicle, you will definitely want to read on... I can save you time and money and your vehicle will last longer. How? By selling you the best oils on the planet. That's not just a sales pitch... it's simply a fact as you will see. A few years ago I blew the engine in one of my cars. As you would expect, repairs were very expensive and I began to do some research to find out how I could make my next car last longer. Again and again the name AMSOIL kept popping up. I found out that AMSOIL was "The First in Synthetics". AMSOIL's founder, A.J. Amatuzio after 25 years as a jet fighter squadron commander began to wonder how well synthetic jet oils would hold up in automobile engines. He began developing the oil in the 1960's and by 1972, after extensive research, development and testing, he had formulated the first API certified fully synthetic 10W-40 motor oil for cars. From day one, AMSOIL was designed to go 25 thousand miles between oil changes... not 3 thousand like petroleum oils. In fact, AMSOIL's founder had proven that an engine would suffer less wear and abuse with AMSOIL and 25k miles between oil changes than with a petroleum oil and 3k miles between oil changes! Unlike every other oil company around, A.J. Amatuzio would never settle for second best. Every oil had to be produced from the very finest base oils and additives known. Never would an AMSOIL oil be formulated down to a price as the competition does. Consequently, many AMSOIL oils and greases are more expensive than the competition. But as you will see, initial price doesn't tell the whole story. For A.J., quality and performance were always top priority. A.J. felt that a customer would rather use the best oils and stretch out the drain intervals offering the convenience of not having to have their oil changed as often. Not to mention owning a vehicle that will last far beyond it's normal life expectancy. Since I put about 20k per year on my cars and because I tend to be rough on an engine, I use AMSOIL's Series 2000 0W-30 in my cars. It's good for 35k miles or one year. I get smoother operation, better gas mileage and amazing performance. But what if I don't change my own oil? Good question! A lot of people will never change their own oil, but this is not a problem. Most oil change shops will be happy to change your oil with whatever oils and filters that you bring with you. They would rather do that than lose a customer. Just call and ask. Most will charge you about $15. AMSOIL oil filters are also designed to go the distance. With larger capacity and superior filtration and flow... accept no substitutes! So how much will this really cost me? 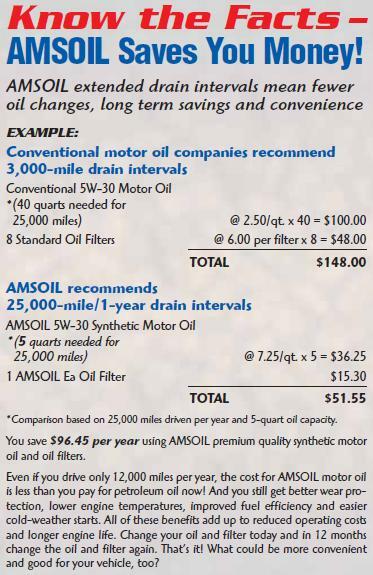 It depends on the oil you choose [call me for help on this locally at 704-779-2385 or toll free at 1-877-OIL4SALE (1-877-645-4725)] but here is a simple comparison of how much you will save by using AMSOIL oil and filters. This does not take into account the tremendous savings you can enjoy because of better gas mileage, less repairs and longer vehicle life! AMSOIL's Transmission fluids and drive axle fluids are also the best. I keep using the word "best" and it may sound impossible that one company would carry the best lubricants in each category, but again AMSOIL's founder will not sell anything but the best. In fact, AMSOIL is widely know as the "King of Comparisons" for constantly beating the competition in laboratory tests. These tests are quite often printed out directly on the product labels. Also keep in mind that AMSOIL is way ahead of the curve verses the competition, having been in the synthetics business for 35 years, constantly designing and refining new and existing products. The reason I mention these other lubricants is because of a test that was conducted with AMSOIL lubricants verses the competition's that resulted in an average 8.2% miles per gallon increase! In the test, all three fluids were changed (engine oil, transmission fluid, and drive axle fluid). You can read about the tests conducted at THIS LINK. I think you will agree with today's gas prices, this is a very significant study! I did a little calculation for my own car assuming an 8.2% gas mileage increase (many report better). Driving 20 thousand miles per year with gas at $3 per gallon and starting with 25 mpg, I would save almost $200 per year from the gas mileage increase ALONE! That does not include the savings from spending less money on oil and filters (from the chart above), reduced maintenance costs, and longer vehicle life. To see how these last two items pan out, read THIS LINK. You will see how one business documents a savings of $1,400 per year per vehicle by switching to AMSOIL! 1) Become a Preferred Customer at $20 a year or even $10 for a trial six month period. 2) Become an AMSOIL Dealer and make a business out of it for $30 a year. Option 2 made good sense to me and GoodSenseOil was born. Naturally you have the exact same choices I did. If you only need to place a small order, it might make sense to pay retail. Call me first and we'll run the numbers together. I can even give you a discount from the retail price without going with one of the wholesale options. However, most of you will benefit greatly by becoming a Preferred Customer and many of you may see the potential benefits that a business of this type can provide. I live in Charlotte, NC and I can assure you that the potential for this type of business is astounding. There are no protected territories and most people and companies have never heard of AMSOIL! Now THAT is a wide open market! Enough said. We ship to all 50 states daily from 11 convenient warehouse locations. Your order will normally arrive in 2 to 4 days.